All stats are updated through the games of April 3 For up-to-the-minute coverage of this week’s college basketball action, visit us on Twitter and follow @PalestraBack. Last season, when Virginia became the first ever top seed to lost in the first round, much was made out of De’Hunter Hunter’s absence. He missed the loss to UMBC with a wrist injury, giving many Virginia fans and apologists a go-to excuse. Hunter gave Virginia a different element offensively. No player on Virginia, this year or last year, was better suited to attack the paint than Hunter. He has the size, length, and first step to aggressively slash into the paint against nearly any matchup. Virginia’s other primary scorers, Ty Jerome and Kyle Guy, are both primarily jump shooters, so Hunter’s talents make for a perfect antidote when outside shots aren’t falling. It was interesting to then see how Virginia head coach Tony Bennett handled Hunter at the end of Saturday’s overtime win over Purdue. During crucial crunch time possessions, in regulation and overtime, Hunter was planted firmly on the bench. He hadn’t played his best offensively earlier in the game, but his presence was missed. Virginia’s offense, during the most important moments of the Hoos’ season, was entirely based on Jerome and Guy swinging off screens and looking for outside shooting. If not for a miracle last second shot, this lack of scoring late in the game would have cost Virginia its season. When he returned to the lineup in overtime, Hunter attacked the paint twice, drawing a shooting foul and scoring a layup in traffic in the final two minutes. Only Tony Bennett and his staff know why Hunter was glued to the pine late in the game, but his usage this weekend can change everything about Virginia’s offensive outlook. If he isn’t at his best, or on the floor, the Hoos are far less likely to cut down the nets. I’m personally curious how Minneapolis will fare as a host city for the Final Four. When I was inside US Bank Stadium (to see the Eagles win the Super Bowl, not a big deal), it didn’t feel like a gigantic dome like many other football stadiums that have hosted the Final Four. Regardless, another set of big basketball games inside a football stadium will perpetuate the myth that teams can’t shoot in big domes. At the last three Final Fours, all of which were played at large football stadiums, teams have shot a combined 137 for 399 from outside the arc. That averages out to 34.3 percent over a nine game stretch. That’s right around this season’s national average of 34.4 percent shooting, from thousands of games played in standard gyms and arenas. Michigan State may have the best basketball coach in the nation. He’s certainly among the ten best at his job, without question. There are questions, however, about Izzo’s work off the court. Izzo was one of several Michigan State officials who was named in an Outside the Lines report alleging a series of sexual assaults by Spartan athletes went unreported, under-reported, or were never resolved. Izzo denied any wrong doing and stood by his staff’s handling of any such issue. 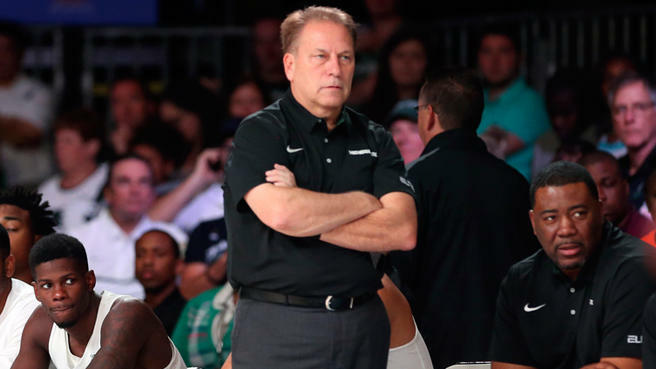 After speaking on the issue in October, Izzo’s image has seemingly rebounded. I’ve watched every Michigan State game this tournament and haven’t heard a single broadcast mention Izzo’s role in the scandal. He’s been neither indicted nor exonerated in this case, leaving everything in limbo. I don’t think Final Four weekend needs to turn into an Izzo interrogation, but this has to be addressed in some way. If Ty Jerome chooses to leave Virginia for the NBA after his junior season, he’ll get drafted, probably somewhere between the 25th and 45th picks. There are certainly reasons to like Jerome’s chances at the next level. He is a capable ball-handler, adept passer, wildly elite shooter, and has a crafty floater game. None of that will matter, however, if he gets chewed up on the defensive end of the floor. Jerome is not a bad collegiate defender. He plays for one of the best defensive teams in college basketball and is a willing, active defender. In Tony Bennett’s Pack Line defensive, however, any of his athletic shortcomings can be excused. The Pack Line is not a zone, yet it can function like one at times. Help defenders are always readily available, aiding Jerome when he’s the primary on-ball defender. I’m not sure how much of his defensive success can translate to the NBA. Against Purdue, Jerome never spent time guarding Carsen Edwards. That assignment was dealt to freshman Kihei Clark and the taller De’Andre Hunter. Edwards is a great college player, but far from the kind of test Jerome will face in the pros. I’m curious to see how Jerome does against players like Bryce Brown and Jared Harper in the semifinal, or Cassius Winston in the final, if both teams advance. Texas Tech’s coach deserves every ounce of praise he’s received and every single dollar he’s earned this postseason. In just four years as a Division I head coach, Beard has built quite a resume. In his first, and only, year as the head coach at Arkansas-Little Rock, Beard led his team to the NCAA Tournament and an upset win in the round of 64 over Purdue. After leaping to Texas Tech, Beard’s first team in Lubbock won 18 games for just the third time in a decade. Last March, the Red Raiders advanced to the Elite Eight, despite leading scorer Keenan Evans battling with turf toe throughout March. Now in just his fourth year manning the sidelines, Beard coaches the top defensive team in the nation, has a surefire lottery pick on his team, and is coaching in the Final Four. I don’t know if he can turn Texas Tech into a perennial power, but I’m not betting against Beard. I hope you’re ready to see a lot o Chuma Okeke on Saturday. The Auburn sophomore had an impressive tournament run cut short by a dramatic ACL injury. As the Tigers marched past Kentucky, the CBS cameras were sure to have eye on Okeke behind the Auburn bench. If Auburn continues to succeed without their best interior scorer, expect more of the same during an Auburn win. If Okeke’s absence is notable, with Virginia pounding the paint, expect even more shots of Okeke. There’s something really special about players like Cassisus Winston. DraftExpress lists Winston as the 87th best prospect in this June’s draft. He’s 21 years old in his junior season. Winston stands 6-foot-1, yet looks shorter due to a doughy physique. His pure athleticism is overmatched by nearly every point guard he faces. Winston’s quicker than he looks, yet is not succeeding based on his foot speed. Winston does succeed though. He finds crafty and inventive ways to penetrate beyond the first level of defense. A well placed hip check or stutter step does wonders for Winston. His jump shot isn’t going to inspire shock and awe like Kyle Guy’s or Carsen Edwards’, yet Winston is quietly super efficient as a shooter. In three years as a Spartan, he’s made 43 percent from long range and 84 percent at the free throw line. Most importantly, Winston has absolutely elite court vision. Every year that Winston has played at Michigan State, he’s led the Big Ten in assist rate and posted the second best assist rate in the nation. Per Sports-Reference, Winston has the best career assist rate in their database, which dates back to 2010 for that statistic. I don’t know if Winston will succeed in the NBA or lead the Spartans to a title this weekend. I do know that Cassius Winston knows how to play basketball and can pass to teammates as good as anyone in world. Not a lot more to say about this. Just wanna watch it again. Virginia’s most important freshman has grown by leaps and bounds this season. Through 26 games, Clark was shooting just 29.6 percent from the floor. He was an absolute zero on the offensive end of the floor. He was making less than one 3-pointer per game and shooting just 31 percent from outside, adding 2.2 assists per game in that time frame. In Virginia’s last ten games, Clark has been a different player. The freshman has shot 48 percent from the field in those games, increasing his outside shooting percentage above the national average to 36 percent. Clark has averaged 3.2 assists per game down the stretch, finishing six of those ten games without committing a turnover. Against Purdue, when Tony Bennett chose to keep De’Andre Hunter on the bench, Clark stayed in the game to run the offense and guard Carsen Edwards. 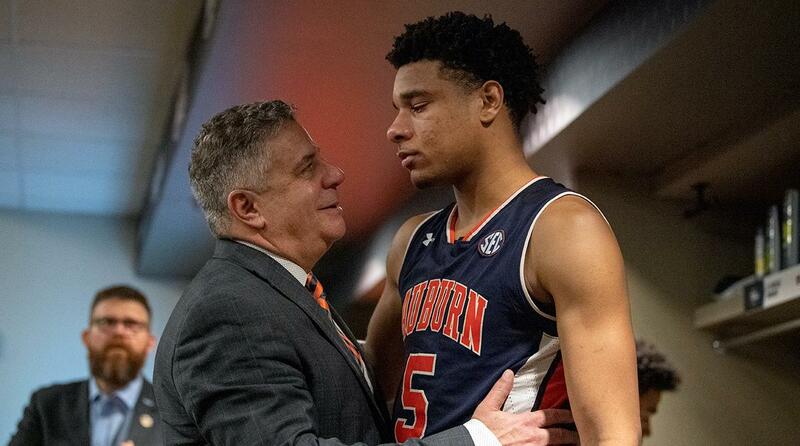 It was as big a vote of confidence that a coach could give to a freshman guard. Bennett’s belief in Clark paid off, as the California native corralled the rebound after a teammate slapped Ty Jerome’s missed free throw past half court. As upperclassmen around him begged for the chance to win the game with a half-court shot, Clark reacted remarkably calmly for a freshman holding a ball down by 2 points and more than 50 feet from the rim. With under three seconds to play, Clark rifled a one-handed pass off the dribble all the way to the elbow to Mamadi Diakite for the game-tying jumper. There’s not enough that can be said about that pass. It’s one of the best passes in NCAA Tournament history. Let’s see if Clark has an encore in him. Second, a happy Charles Barkley. Finally, Toomer’s corner. War Eagle. I never want to see Flo again. She’s not the maid. We get it. Make it stop. The AT&T bad announcer commercials are fine by me because they star Tim Baltz, who is one of the funniest up-and-coming comedians working today. Get those checks, Tim. If offered the choice of a free Orange Vanilla Coke or the chance to have a car battery thrown at my head, I’d brace for that EverStart to bean me in the noggin. Jay Wright likes lawns. Great. Larry Bird is the worst actor on planet Earth. His line delivery is an abomination in that commercial for…whatever those Barkley, Sam Jackson, Spike Lee commercials are for. Capital One? I honestly don’t know. I’ve seen those ads like 400 times in three weeks. Capitalism is a hell of a drug. Since the inception of the BCS system in 1998, few schools have been to the mountain top of both college football and college basketball. Since 1998, just seven schools have played in the Final Four in basketball and the national championship in football. Auburn joins Oklahoma, Ohio State, Texas, Florida, Oregon, and LSU in this hallowed company. Of those seven schools, only Florida has won a national title in both sports in the last 20 years. I’ve been picking games over on Twitter all year long. Don’t look at my record. It’s not important. What is important? I’ll take both favorites on Saturday. Michigan State is laying 2.5 points and Virginia is a hefty 5.5 point favorite. Should the Hoos advance to the title game, I’d likely take them again. Virginia is the best team in Minneapolis, by a comfortable margin. …will be published here on Friday, as is tradition.